Zaragoza, Spain, 8 April, 2019 (IICA). Promotion of specific measures for young people in rural areas, such as support for innovation, digitization, associativity, and bioeconomy-based production development, among other things, are just some of the efforts that IICA is undertaking to revitalize agriculture in Latin America and the Caribbean (LAC), and which it discussed at a conference about generational succession in agriculture, held in Spain. The Inter-American Institute for Cooperation on Agriculture (IICA) recently participated in a conference in the city of Zaragoza to debate strategies that should be implemented to make the primary sector more attractive to young people and to boost its profitability. In Spain, like in LAC, rural migration poses one of the greatest challenges for agriculture, with the average age of producers exceeding 53 years. Consequently, there are increasing calls from the public and private sectors in support of initiatives to encourage young people to play a more prominent role and to work in the many agricultural operations that are in danger of disappearing. 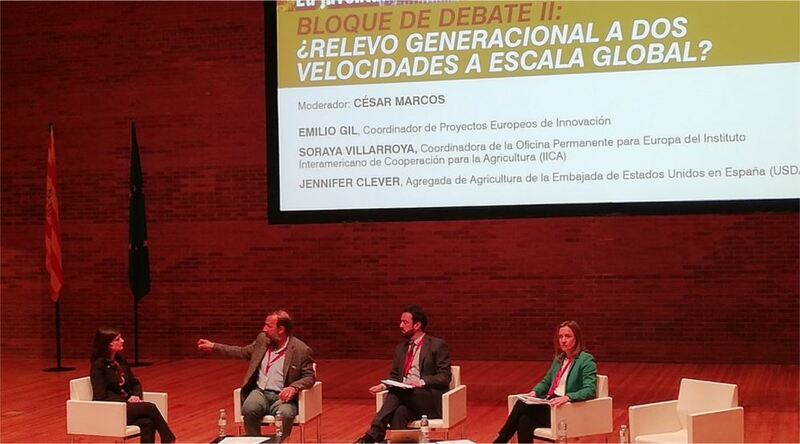 Soraya Villarroya, Coordinator of the Institute’s Permanent Office for Europe (POE) represented IICA at this Fórum Jóvenes Agricultores (Young Farmers’ Forum), which was organized by Interempresas Media. Carolina Gutiérrez, Deputy Director General of Rural Environment Promotion at the Ministry of Agriculture, Fisheries, and Food (MAPA); and Joaquín Olona, Minister of Rural Development and Sustainability of the Autonomous Community of Aragón, were panelists at the inaugural roundtable. Forum panelists agreed that young people in rural areas across the world face similar issues, such as low financial inclusion and difficulty in accessing land. Gutiérrez stressed the need for public policies that include measures that are favorable to women and that focus on revitalizing rural areas. Incidentally, on the same day, MAPA held a public event in Madrid to announce its digital strategy for the agrifood sector and rural environment, which will be geared toward bridging the digital divide, between both urban and rural areas and small and large enterprises. IICA participated in the round table that discussed policies in support of rural youth at the international level. Villarroya highlighted the situation of young people in LAC’s rural areas and the Institute’s efforts to design specific actions targeting rural women and young people and fostering technology and innovation. Villarroya remarked that, “Young people are agents of change in their communities, since they pursue positive social, economic, and environmental transformation, and they must be taken into account in the process of designing policies”. Other presenters in that roundtable were Jennifer Clever, Agricultural Attaché at the United States Embassy in Spain; and Emilio Gil, Professor of the Agrifood Engineering and Biotechnology Department of the Polytechnic University of Catalonia, who spoke about European programs in support of agricultural innovation. It was apparent from the conclusions of the discussion that, despite differences such as the educational and organizational levels, rural youth in various parts of the world face similar issues, such as low financial inclusion and difficulty in accessing land. LAC is home to 163 million young people, close to 30 million of whom are rural inhabitants, accounting for 25% of the total rural population. Of this 30 million rural youth, almost 12 million are unemployed and 9.6 million are involved in agricultural activities. The disparities between rural and urban youth are evident, and are further exacerbated in the case of women and indigenous people. With this in mind, it is imperative that actions be taken to reverse the situation, for example, to facilitate value chain improvements through more intensive use of information and communication technologies (ICT) and better access to education.